I wanted to share Andrew Knapp’s moving article in the Post & Courier, which was first published on August 8th. 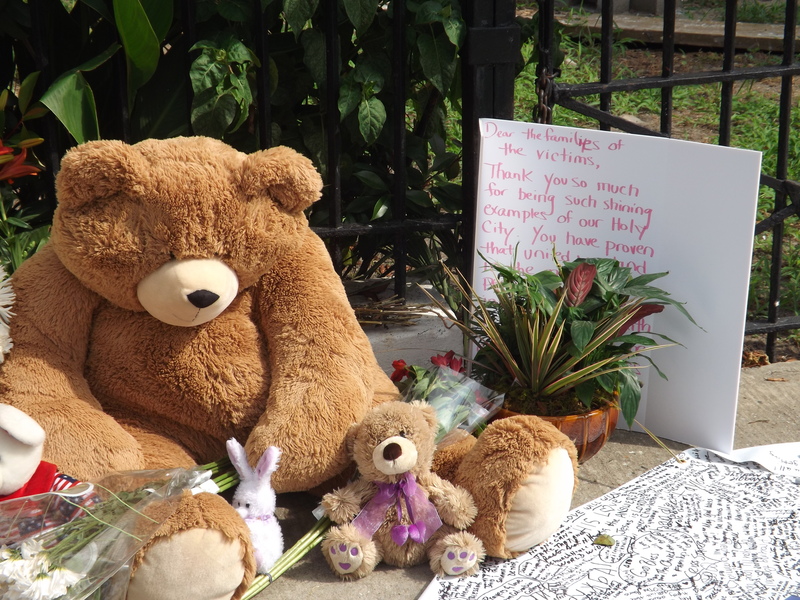 It describes the lengths to which people from all over the world are going in order to express their heartfelt words of sympathy for the tragic massacre on June 17th and how the Emanuel AME Church and its members plus many volunteers are responding by preserving thousands of messages of love, support, and prayer. 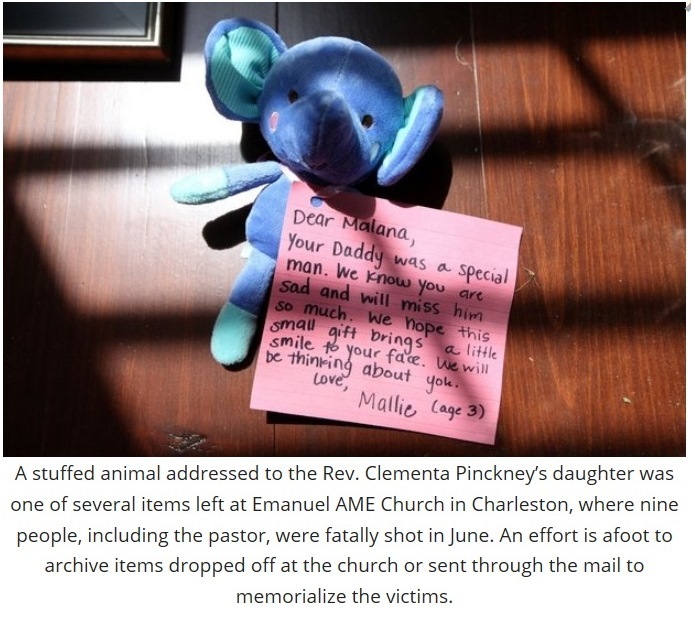 Elizabeth, “Liz,” Alston, historian of Emanuel AME church and a former member of Drayton Hall’s Site Advisory Council, is leading this effort to archive these items, and I and other Charleston museum professionals are pitching in. On Friday and Saturday after the shootings, I visited the church to pay my respects and was struck by the number of tangible expressions of concern and support that people left in front of the church: hand-written notes, teddy bears, banners filled with signatures, hand-made crosses, candles, paintings, photographs, and scores of bouquets of flowers. They told of this moment in time, not only for our community but for our nation. It had not yet rained, and I was concerned that when the summer storms came, as they surely would in June, they would spoil the signed banners and artifacts. I called Liz and asked if they had plans for their preservation. She explained that, as a historian, she was thinking in the same way, but that the church was in the midst of grieving and had lost its leadership and was focused on conducting funerals and caring for any number of things large and small. She too was devastated, but nonetheless, suggested we meet. After signing a banner in front of Emanuel on Friday after the tragedy and seeing all the other testimonials, I contacted Liz Alston, historian at Emanuel. Cross with notes and artifacts in front of Emanuel. Messages from the heart and soul. I called a range of museum and preservation professionals, including John Hildreth, regional vice president of Eastern Field Services of the National Trust, Faye Jensen, director of the SC Historical Society, Toni Carrier, co-founder of Lowcountry Africana and a former fellow with Drayton Hall, Rebecca Campbell, a Drayton Hall descendant, who grew up near Emanuel, Kitty Robinson from the Historic Charleston Foundation, Carl Borick, director of the Charleston Museum, and others. Each responded positively, and just a week after the tragedy, we met in the ground floor room, where the shootings had taken place a week earlier . First meeting of the memorial committee. Clockwise from top: Liz Alston, Toni Carrier, Rebecca Campbell, Virginia Ellison, Faye Jensen, John Hildreth, and George McDaniel. It was discomforting to be in that same space yet also uplifting to see the life of the church continue, as members, young and old, came and went, comforted one another, and got ready for the Bible study that evening, the same study conducted a week earlier with the assassin present. Discretely to one side were chamber music musicians, including Charleston violinist Yuri Becker, who were there to play and to express through music their support for the Bible study that evening. We had our meeting, got the ball rolling for preserving artifacts, and since it had not rained, we brought a number of them into the church, including a large cross, and stored them in a side room. Foreground, L-R: Unidentified priest and Virginia Ellison remove signed banners for safekeeping on first day. 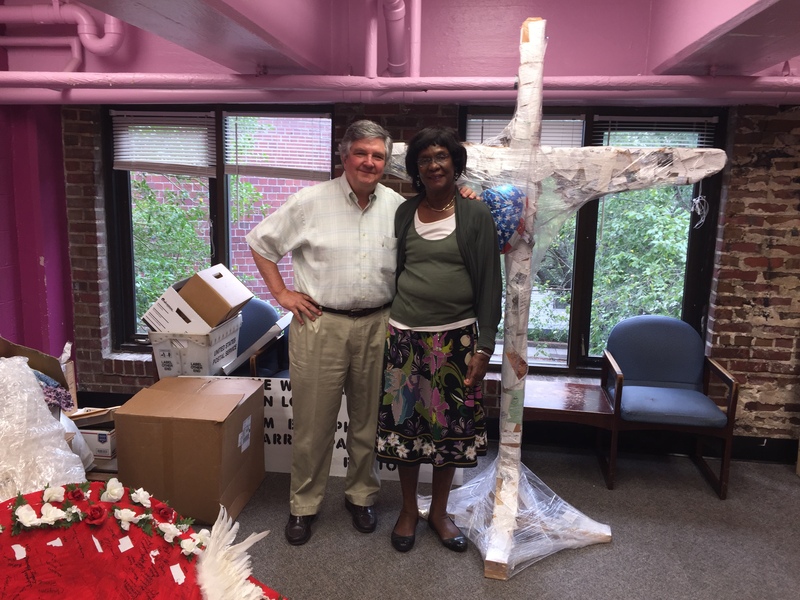 Me and Liz Alston in front of a cross with note cards of support. This was one of the first precious items that we rescued a week after the shootings and just before a thunderstorm. While we were retrieving artifacts, a press conference was held directly in front of the church. About a half dozen pastors were gathered, and I was glad to see among them The Rev. Callie Walpole, an Episcopal priest in Charleston whom I know and who is the niece of friends of mine. The principal speaker was The Rev. Nelson Rivers, pastor of Charity Missionary Baptist Church and vice president of the National Action Network. Speaking forthrightly into television cameras, he explained in no uncertain terms that this was the time for “respect.” Protest has its time, but not at this time. These families have experienced loss beyond our understanding and will be respected during their times of grieving, as will their church and community members. With force, he declared, “Malcolm X was about respect. Martin Luther King was about respect. The civil rights movement is about respect. And if you don’t understand respect, then you don’t belong here at this time.” It was a challenge and an assurance, both for that moment and for our future. Later that night a thunderstorm struck, so our retrieval of memorials had been just in time. Our group met again the next week, assessed progress, and retrieved more artifacts. Virginia Ellison and Celeste Wiley, archivists from SC Historical Society, and Karen Emmons, archivist with Historic Charleston Foundation, proved to be key players and offered the assistance of the Charleston Archives, Libraries and Museums association (CALM). Together, their association devised a well-organized process by which artifacts would be systematically photographed in situ and then retrieved from outside for safekeeping. 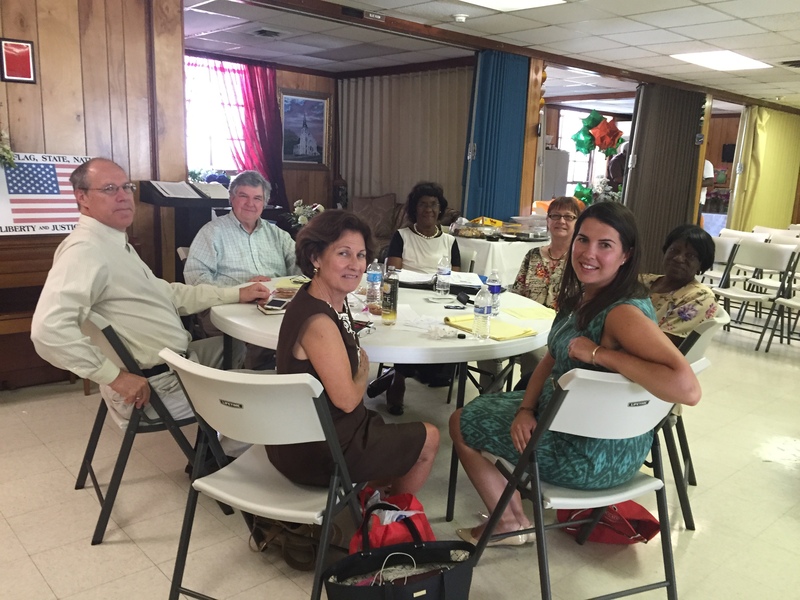 Liz also contacted Mayor Joe Riley, and knowing Liz as he does, he quickly responded by offering both staff support (Danny Burbage and Megan Moughan) as well as temporary storage space in the St. Julian Divine Community Center not far from Emanuel. It was agreed that the articles would be carefully stored there until a more permanent home could be found. Thanks to CALM and the church, volunteers have since been retrieving artifacts on a regular basis and taking photographs before they were removed — papers, notes, teddy bears, canvas frames with inscriptions, crosses, even small rocks with words like “love” and “hope” painted on them and arranged in a circle. In fact, what we won’t remove are the fire hydrant and two or three crepe myrtles in front of the church now covered with hand-written messages and signatures. At a later meeting, we met with The Rev. Norman Goff, Presiding Elder and interim minister for Emanuel AME, whom many of you saw and heard during the televised funeral services. A thoughtful man with a lot on his shoulders and his heart, he expressed his prayerful support and appreciation for our preservation effort. During our meeting, who came by? Gov. Chris Christie, candidate for President. He offered his sympathies and his appreciation for the preservation work we’re doing. Joining us too were historian Bernard Powers and Mary Battle Pinckney from the Avery Research Center from the College of Charleston. In subsequent blogs, I’ll report more, but suffice it to say that in the near future, we will be developing a longer term plan, the development of which John Hildreth has much experience and expertise to provide, and for which, fortunately, he has offered to help. We intend to learn from other sites, like Ground Zero, the Boston Marathon, the Vietnam Memorial, and 16th Street Baptist Church in Birmingham. As an example of a future blog, just this week, Edward Crawford, vice chairman of our board, visited Emanuel with me, and Liz Alston showed us around. Edward, a skilled photographer, took pictures, which we’ll feature here later, and was deeply touched by the power of place and of people. I’ve been deeply grateful to the work with Liz Alston, the Rev. 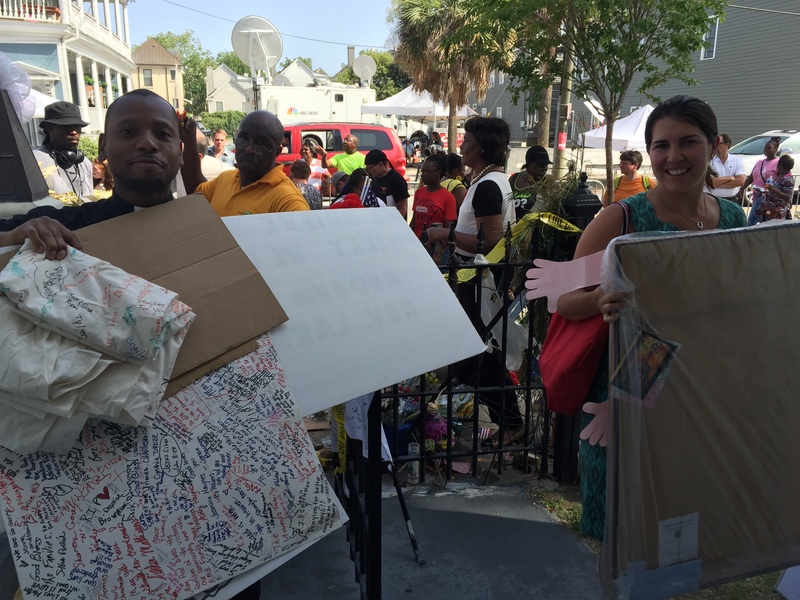 Goff, members of Emanuel, and staff from other museums and preservation organizations in Charleston. Even national support has been provided by the Smithsonian’s National Museum of African American History and Culture thanks to Lonnie Bunch, inaugural director and former Drayton Hall Site Advisory Council member, and Dr. Rex M. Ellis, Associate Director for Curatorial Affairs and a friend of mine. 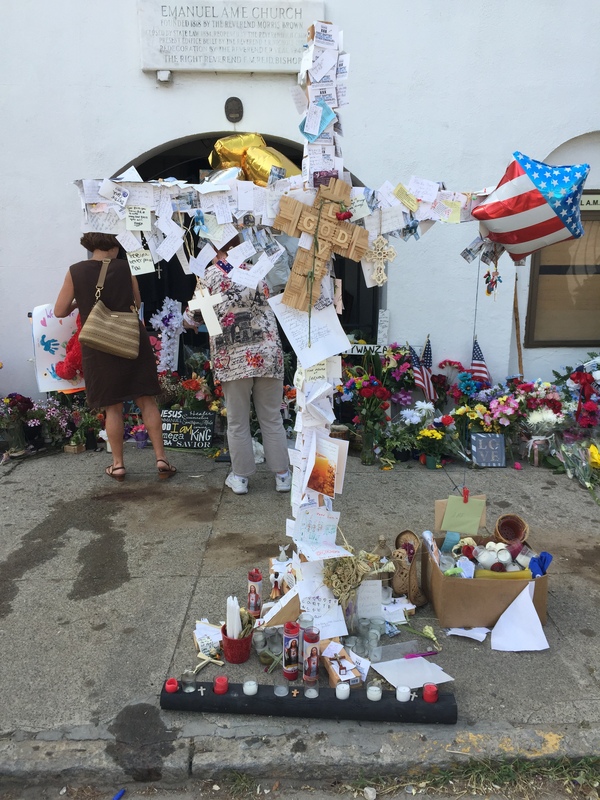 The organization CALM is especially to be thanked for its remarkable dedication to preserving the public response of sympathy, hope, and support to this landmark moment in the history of Charleston and our nation. George W. McDaniel recently retired from his position as President and Executive Director of Drayton Hall. 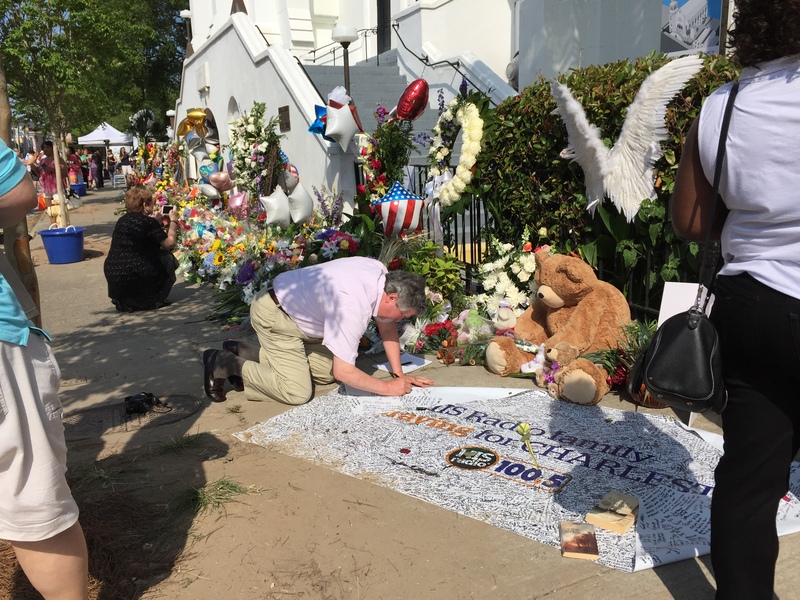 He is currently on sabbatical, during which time he has volunteered his services on behalf of Emanuel AME Church. He returns to Drayton Hall on October 1st to work with the Board of Trustees on several projects through June 2016. All photos are courtesy of George W. McDaniel unless otherwise noted.